Home Cooperative Excellence "Meeting Cycle on Workplace Conflict Resolution"
Cooperative Excellence "Meeting Cycle on Workplace Conflict Resolution"
This meeting cycle provides the space to share experiences and lessons learned and to freely share solutions and ideas for resolving conflicts in the workplace. 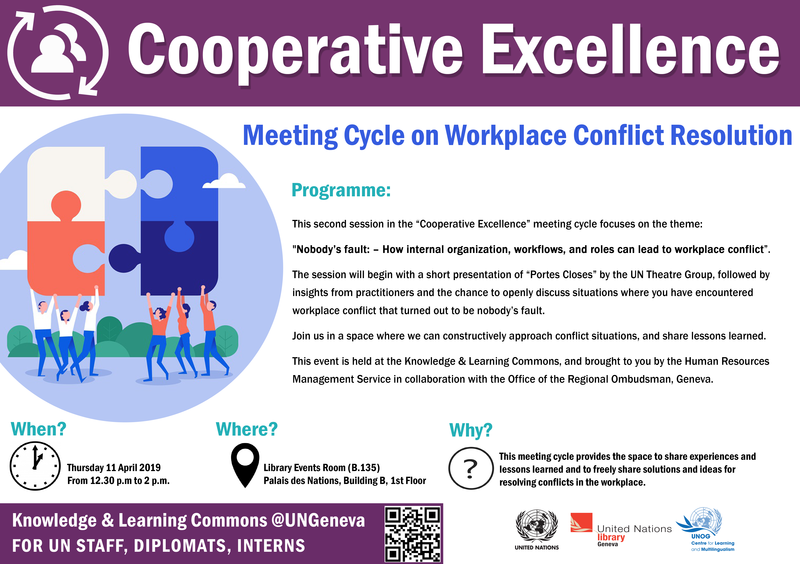 This second session in the ‘Cooperative Excellence’ meeting cycle focuses on the theme of ‘Nobody’s fault: – How internal organization, workflows, and roles can lead to workplace conflict’. The session will begin with the saynète “Portes Closes” by the UN Theatre Group, followed by insights from practitioners and the chance to openly discuss situations where you have encountered workplace conflict that turned out to be nobody’s fault, and share lessons learned. Join us in a space where we can constructively approach conflict situations, and work together on solutions. This event is held at the Knowledge & Learning Commons, and brought to you by the Human Resources Management Service in collaboration with the Office of the Regional Ombudsman, Geneva.